After sincere, but ineffective attempts at changing its image with the Zest and the Bolt, Tata Motors has seen some success after the surge in interest for the Tiago, which was unveiled last year. The small car seemed jinxed initially with its first name Zica unfortunately sounding like the Zika virus and coinciding with its outbreak. But with the new moniker and a refreshed launch strategy, the Tiago still managed to bring Tata back into the reckoning in the car market. Whether its brand ambassador – footballer Lionel Messi – helped in the revival or not, the Tiago has managed to score the key goal of winning back the trust of car buyers. Tata Motors believes that a big reason for the success of the Tiago was the new Impact design language and the engineering changes that were effected as part of the new strategy. The next vehicle from the Tata stable that will benefit from Impact design is the new Hexa. And going by our experience with the new Hexa, it is clear that this will also be another vehicle from Tata Motors that has the potential to boost the brand’s image.Check for Car Loan calculator on Fincarz. 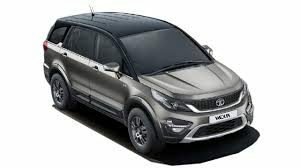 Tata Hexa production ready model that was showcased at the 2016 Delhi Auto Expo hugely resembles the concept which was showcased earlier in Geneva. The looks have been given a muscular appeal, but the butch appearance didn’t affect its stylish character that has been designed keeping in mind the tastes of urban customers. The front profile of the Tata Hexa gets automatic projector headlamps with LED daytime running lamps, while the muscular looking front grille and trapezoidal shaped lower bumper adds a striking presence to the Hexa. Two air dams at both sides of the large front bumper makes the appearance beefy, while the fog lamps have been unusually shaped. The car gets a higher bonnet, which automatically enhances the bolder appearance of the Hexa. The hood sports a few crisp character lines running towards the nose, which manage to give the Hexa a bold and dynamic face. Walk towards the side, and the Hexa’s inspiration from the Aria MPV becomes a lot more apparent. The entire silhouette of the Tata Hexa is nearly identical to that of its MPV twin. The ORVMs get LED side turning lamps, the wheel arches look big enough to give the car a bold look and are highlighted with a cladding. The 19 inch five twin-spoke alloy wheels ensure that the Tata Hexa does not get a bland angle to look at. The car gets a thick cladding at the bottom all around, while the greenhouse area comes with resemblances from the predecessor Tata Aria. It gets a chrome bar at the bottom of the greenhouse area, while the roofline gets roof rails on both sides. The rear profile gets redesigned with horizontally stacked tail lamps, which actually look nice. The faux skid plates can be seen at the rear bottom with dual exhausts integrated to it. This makes the Hexa look like an SUV, while retaining the simplicity of its MPV sibling. The interiors of the Tata Hexa are truly welcoming; thanks to the all-black cabin with superb finishing that gives the feel of a premium vehicle. The car features piano-back inserts and brushed grey plastic and the effort seems to be towards making the dashboard look cool. However, by utilizing several materials and plastics, it looks like the design is lacking classiness. The steering wheel reminds us of the newer generation cars coming out of Tata’s stable. There are mounted controls for audio, telephony and cruise on the large 4-spoke tilt adjustable steering. Sadly, the steering is only rake adjustable not reach and this is certainly a down considering the price this car falls in. Tata has really upped the game in terms of advanced features. The Hexa features instrument cluster with two large analogue dials along with a 3.5-inch advanced driver information display resting in between. The driver information display (DIS) give loads of information and one can switch through the information by using stalks on the right hand side of the steering. Coming to the centre console, it has been gracefully divided with the top portion featuring ac vents and chrome accents and below there is a 5-inch touchscreen infotainment unit. The ConnectNext infotainment with chrome surrounds looks pretty and in fact similar in size fitted in other Tata cars such as Bolt and Zest. But it does the required job as it is loaded with plenty of tech such as Android Auto and Apple CarPlay. The unit also supports plenty of apps including Juke App through which a song playlist can be automatically created to playback desired songs of all the passengers. The ConnectNext app suite also includes NaviMaps for navigation and Tata Smart Remote App for controlling lighting, audio and media screen. The decibels are provided by JBL with 10-speaker setup which is unexpectedly low on output. The door lock and unlock buttons are placed on the centre console instead of usual driver side door pad so some might feel a bit confusing initially but these things get accustomed with time. Moreover, in case you need to open the individual doors from inside, the only option are the pull-type locks which need some effort. The leather covering with white contrast stitching on the seats lends a nice look and feel. The seats are nicely cushioned and are well bolstered as well. Hop on to the driver’s seat and you will find that it can be adjustable in 8 different ways and also comes with lumbar support. However, the footwell is a bit tight since the central tunnel takes some space invading the room available for the left foot. At the front, the centre armrest comes handy while the large door pads offer enough space to dump one large bottle along with small knick knacks. Coming to the second row bench seats, they are comfortable as they have fore and aft adjustment and also reclining functionality so that you can sit with your leg crossed. Further, the second row can be split folded in 60:40 ratio while the occupants will also like the side shades which are manually deployable. And just like most 7-seater vehicles, the third row passengers will be least comfortable. The last row can be accessed by tumble folding the second-row seats. Though it has low under-thigh support, adult can sit there for short highway journeys. Another noticeable flaw is that the curtain airbags only extends to the c-pillar that means the passengers at the third row aren’t protected by them. However, the passengers at the third row do get individual headrests, 3-point seatbelts as well as convenient storage space. The headroom and legroom is just adequate and best for shorter distances as mentioned earlier.With the second and third row seats up, the boot space is 128L which is quite good as compared to cars such as XUV500 which practically gives nothing. Fold the third row seats and it frees up more space while the maximum capacity of luggage is 671L with both second and third row seats folded. Overall, Tata has done a commendable job in terms of providing comfort and practicality in this car. The Hexa’s engine is the same 2.2-litre Varicor 400 diesel engine that is currently available in the top trim Safari Storme. The refined 2,179cc diesel engine is already popular and makes its way into the Hexa in the same state of tune as it is in the Safari Storme. So, the engine generates a peak power of 156PS and a peak torque of 400Nm. Of course, left alone these numbers don’t exactly paint the right picture. The Hexa is almost the same weight as its predecessor (about 2,300kgs) because of the number of new features, even though some weight savings were achieved. But the tuning enables the powertrain to deliver a very peppy performance. The Hexa is quick off the block and offers enough pulling power all the way till about 4,000 rpm. There is only a hint of turbolag and there is no sense of hesitation or perceived vulnerability even in the way the vehicle behaves on the road. Straight-line stability is excellent and there are electronic aids like ESP and traction control helping correct errors if any wheel slippage is detected. Body roll is still there, inevitable with the suspension also set up for a fairly pliant ride. The engine is offered with two gearbox options — a 6-speed manual and a 6-speed automatic transmission. Working your way up the gears is easy in the manual too with most of the torque already available from about 1,500rpm (idling is set at 800rpm). The only crib we’ll have is the slightly rubbery shift feel in the manual gearbox. Surprisingly, the automatic is an excellent gearbox, with perfectly space gears. The auto comes with a sports mode and what Tata calls an auto detect race car mode. The manual gearbox on the other hand has four super drive modes for altering the car’s performance based on the driving surface. The modes are Auto, Comfort, Dynamic and Rough Road. The Hexa will also be available in 4X2 and 4X4 variants. The all-wheel drive system in the 4X4 is an electronically unit via an adaptive system developed by Borg Wagner. But at the rear, the suspension is much stiffer, this approach is to make the vehicle sportier. And this can be experienced at highways where the car feels totally composed as the suspension work as a cover up for the massive size of the vehicle. However, propelling it hard will increase the body roll. The hydraulic steering is light and vague at high speeds and this is a disadvantage. There is overmuch loose at the centre of steering and as you turn into the corners, it appears to be disconnected. But despite of all the odds, the Hexa is unquestionably the best in terms of ride quality in its class. Despite the car having all-disc brake setup, it does not inspire confidence and there is always a feeling that the heavy weight will overpower the braking mechanism. However, from high-speeds of about 80kmph, the car comes to halt without any drama. The safety kit includes a total of 6 airbags with 2 airbags, ABS with EBD and corner stability control forms the part of standard equipment. Other features include electronic stability program with roll-over mitigation, traction control, hill hold control, hill descent control, reverse parking sensors with camera and front and rear fog lamps. Tata Hexa On-Road Price in Gurgaon ranges from 13,33,595 to 19,51,042 for variants Hexa XE and Hexa XT 4X4 respectively. Tata Hexa is available in 7 variants and 5 colours. Below are details of Tata Hexa variants price in Gurgaon. Check for Hexa price in Gurgaon at Carzprice. Tata Hexa was one of the best products showcased by Tata Motors at the New Delhi Auto Expo 2016. The car comes with a sophisticated touch to keep things balanced. The 6 seater idea is a negative point though, Tata Motors has offered the new Crossover with both 6 seat as well as a 7 seven seating option.. Till now Tata Motors has offered 5 speed manual gearbox in their products, but this is the first time they will provide a 6 speed manual transmission. Apart from that, a six speed automatic gearbox and 4-wheel drive will make things even more interesting.